The Rangemaster Classic 90cm Cooker Hood provides innovative designs and a wide variety of options to modernize your kitchen range. It is designed to work with all Rangemaster, Kitchener, Classic, and Elan range cookers providing much versatility and more options to choose from when shopping for a new range cooker. This cooker hood is available in three colours: black, cream, and cranberry. The cooker hood has a clear Rangemaster logo badge in a chrome colour on the front of the cooker. It also has a towel rail to add a more classic and traditional design to the cooker hood. The black hood has additional options of either a brass or chrome trim. This hood has three filters which can be easily removed and cleaning them is a breeze. 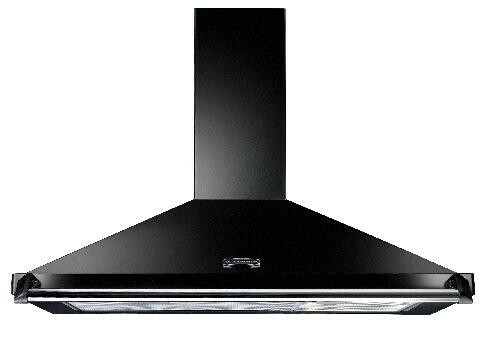 This classic cooker hood includes two 50 watt halogen spot lights, three speed control settings, and all features are controlled by a simple switch and a slide motion feature carefully placed under the front of the cooker hood. These switches control speed, the halogen spot lights, and turning the cooker hood on and off. Noise levels range from 51dB to 65dB and air capacity speeds range from 270 m3/hour to 530 m3/hour.